Front screen projection is one of the specialities of Macada Innovision. As one of the few specialised companies in the Netherlands, we are able to produce and install very large, seamless front projection screens ourselves. 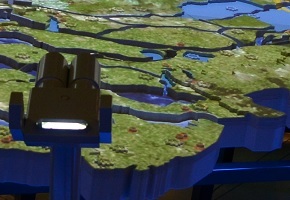 This projection technique works best in spaces that can be almost completely darkened, such as theatres and conference halls, auditoriums or cinemas, classrooms and meeting rooms. In the case of front screen projection, the projector is placed in front of the screen, for example suspended from the ceiling or standing on a table in the projection area. To achieve a good result, the room must be able to be darkened. A disadvantage of front screen projection is that, during presentations, a presenter is not able to move freely back and forth in front of the screen, something that is possible with rear screen projection. A person standing between the screen and the projector interferes with the image and is blinded by the projector.